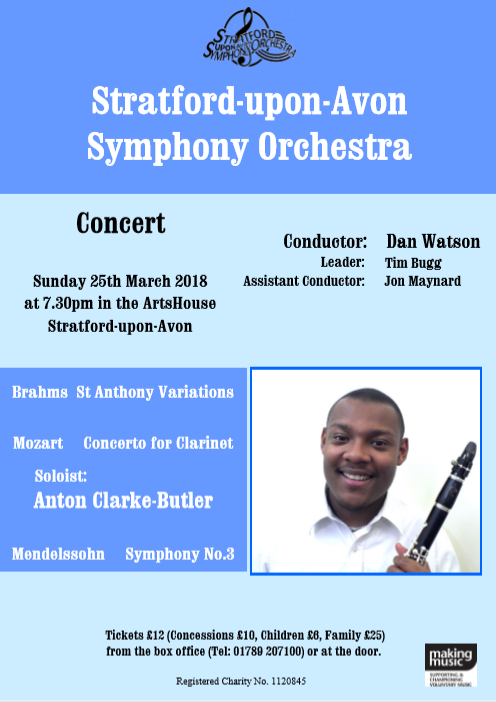 On Sunday evening, 25th March, a capacity audience was entertained, yet again, to a classical concert in the STRATFORD-ON-AVON ARTSHOUSE – by the sixty strong STRATFORD – ON – AVON SYMPHONY ORCHESTRA. This orchestra is amateur, its members unpaid (just exercising their hobbies). But in performance they are professional, led by their inspiring young conductor, Dan Watson. Some of the players drive long distances to weekly rehearsals, and termly concerts . The orchestra was joined by clarinet soloist Anton Clarke-Butler in Mozart’s concerto for clarinet. He is a charming and relaxed young player, with a wicked sense of fun, currently a post graduate student of the Royal Birmingham Conservatoire. His performance predicts a meteoric rise to international fame. Dan, the conductor, also a former Birmingham student, has the personality and skill to extract wonders from his orchestra, with the minimum of gesticulation. He is setting a new trend in orchestral conducting , avoiding the wind-milling “watch me” style , now often fashionable, particularly if on the TV ! 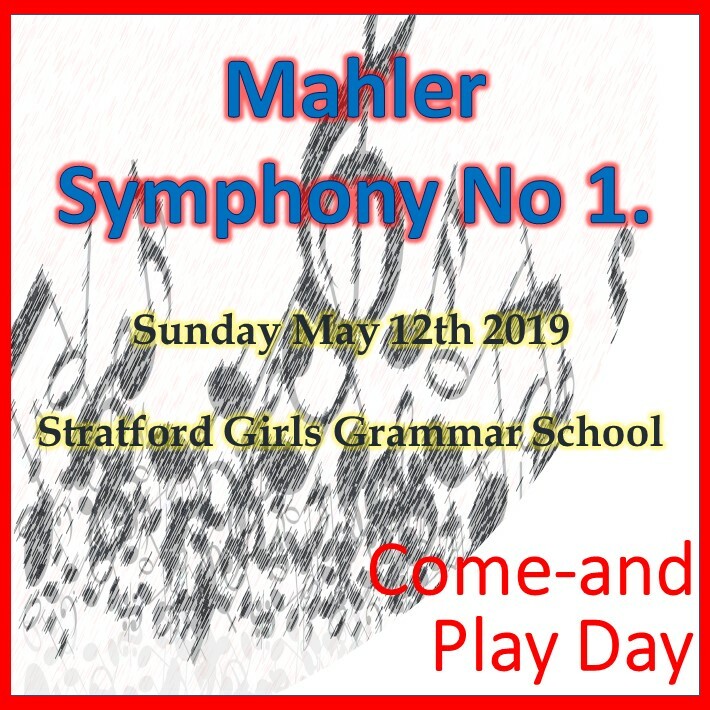 The programme started with Brahms nine short variations on the well known St.Anthony Chorale, whilst warming up both players and audience for the two major classical works to come. The varied styles of these nine short movements take one by surprise ! It is a lovely composition, which should be heard more frequently. Mozart’s Clarinet Concerto followed. This major work, whilst demanding technical competence from both soloist and orchestra, is in the easy-to-listen-to style we expect from Mozart. 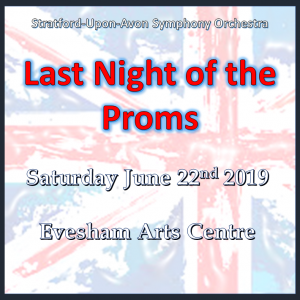 We were lulled into calmness – only to be awakened by some astonishing phrases calling for technical wizardry, to which both soloist and orchestra responded brilliantly. A brief interval was followed by the lengthy and challenging Symphony No. 5 in A minor of Mendelssohn. This work illustrates the composer’s skill in creating romantic music onto our heritage of Bach, whose music had always fascinated Mendelssohn. Dan led the orchestra through this substantial and multi-themed major composition – to the great delight of the audience, whose applause seemed never-ending ! 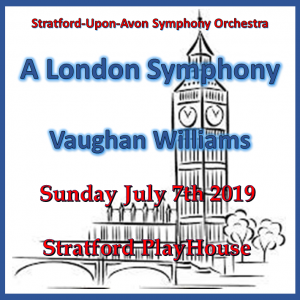 Stratford is fortunate to have this amazing “amateur” orchestra to add to its Shakespearean cultural heritage.